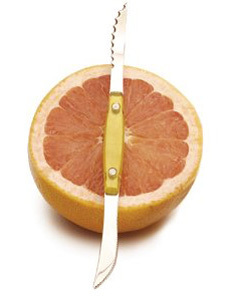 yourself to this snazzy double grapefruit knife. Photo courtesy RSVP. Grapefruit and oranges are excellent snacks and ingredients. We love to add them to green salads and light sauces for fish and seafood. And we have a passion for grapefruit sorbet and granita. But grapefruit can be difficult to peel and pith (the pith is the white membrane). Whether you don’t like to eat it or you don’t want pith marring the look of your fruit salad, here are tricks to peeling and pithing. Boil the grapefruit for 5 minutes. The pith will come away with the peel. Run the grapefruit under cold water if it’s too hot to peel. Similarly, if the grapefruit is too difficult to peel, pour boiling water over it and let it stand for 5 minutes. If you’ve already peeled the grapefruit and can’t easily remove the pith with a serrated grapefruit knife, dip the grapefruit in hot water for two minutes and try again. By the way, the pith is good for you. It contains pectin, a soluble fiber that has the potential to lower LDL cholesterol, improve insulin resistance and aid the gastrointestinal tract. Pith also contains bioflavonoids, powerful antioxidants that may help prevent cancer and cardiovascular disease. And you thought you were eating grapefruit for the flesh (which contains the antioxidants beta-carotene and vitamin C, plus lots of potassium)! This tip is courtesy How To Repair Food, a handy little book.